In this post, I have collected some upcoming indie games of 2018. 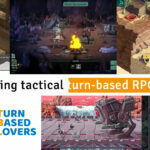 Below you will find tactical/strategy turn-based RPG with a release date declared for 2018, even though most do not have a precise release date yet. * If other promising turn-based games come out, I will add them to this list. From the makers of Halcyon 6 comes a challenging tactical rogue-lite RPG set in an endless interplanetary rebellion against an evil authoritarian empire. Lead a ragtag squad of rebels in their desperate fight against overwhelming odds, an evolving adversary, and relationship woes. One of the most anticipated rogue like turn-based RPGs of 2018 that has recently started its Kickstarter campaign developed by indie Ink Stains Games from New York. In STONESHARD, we play as the leader of a caravan traveling to the kingdom of Aldor to assemble a group of allies in order to restore peace or destroy the kingdom. This will be our choice. The fights are inspired by games such as ADOM, THE PIT, TANGLEDEEP, ROGUE EMPIRE. The game features an interesting feature is the Stealth System, which will allow us to move in the shadows and hit our enemies behind with critical hits. Exploring a flooded post-apocalyptic world in this new promising turn-based tactical RPG. Heavily inspired by games like Fallout, X-com and FTL. The independent HOF STUDIO based in Atlanta is working at Depth of Extinction. A new pixeled turn-based game that features in-depth strategic gameplay and high replay value. We will explore a procedurally generated world map in FTL style with our submarine. We have to choose from different destinations (nodes), each one with his reward: weapons, armors, fuel, soldiers. Embark on an epic adventure and travel to the borders of the kingdom of Broken Britannia in this Final Fantasy Tactics like turn-based strategy game developed by Firecast Studios and Fableware Narrative Design. In Sword Legacy: Omen, we will take control of Uther and his companions (among these there is the mage Merlin) and we will face turn-based combat on grid-based map. Each map is designed to offer a good level of challenge. We have to take advantage by exploiting explosive barrels, precipices, and traps of various kinds. Sword Legacy: Omen fits well in my upcoming indie games of 2018 list. Developed by Chucklefish (the creators of the excellent Starbound), Wargroove is a turn-based strategy inspired by games such as Advance Wars and Fire Emblem. A turn-based game for up to 4 people in multiplayer and single-player campaigns where you can unlock a lot of content. In addition to the army in the game, you will have Generals with unique skills that can make a difference in battle. But these special soldiers will not have to die or it will be Game-over. Another amazing upcoming game of 2018 is The Banner Saga 3. The third and final entry in Stoic’s critically acclaimed Viking series. New playable characters including dredge heroes and a new battle waves system against a myriad of new enemies. Drive your own narrative as you carry over your choices from both Banner Sagas 1 & 2. The game is already released and you can get it here. This is a Turn-based RPG inspired by DARKEST DUNGEON. The particularity of IRATUS is that in the game we are the villains and we must try to escape from the prison where IRATUS has been held for many years. Phantom Doctrine is a strategic turn-based espionage thriller set at the peak of the Cold War. Drawing on a wide variety of influences and capturing the subtle intrigue of classic spy films, the game thrust the player into a mysterious world of covert operations, counterintelligence, conspiracy, and paranoia. MechCorp. is a turn-based tactics game with a strategic layer where you take command of a mercenary mech squadron in space. Decide which battle to fight and what contract to pursue while you managing every aspect of the squad including squad lineup, crew management, research and production. Rise of the Third Power is a love letter to the glory days of the console style RPG, with modern conveniences such as auto-save, and a combination of the best elements of Japanese and western style gameplay and writing. Experience this fusion of east and west, old and new, in a game meant to surpass Stegosoft Games’ previous work in every way! The informed minority Vs. the uninformed majority: а turn-based tactical multiplayer in a retro sci-fi setting with randomly assigned roles and Mafia/Werewolf party game features. Colonyship-4: Survivors is an indie project developed by Wyatt T. Courtney. The game is inspired by Xcom, in fact, we will have our base where we can carry out research to improve and produce new weapons and armor, we can recruit new soldiers, each with its own characteristics and possibilities for development. One component that differs from Xcom is the free exploration phase. In fact, in the game, we will find ourselves on an unknown planet and we will have to explore it in order to find an escape route. Currently, ColonyShip-4: Survivors is under development and a Kickstarter campaign is underway to raise the funds needed to introduce other interesting elements within the game. The release date will be November 2018. Here you will find the steam page of the game. A game where we can choose from 12 heroes, each with their own background and skills. We will explore dungeons and return to the old church to rest, accept new quests and improve weapons and skills.